In a medium mixing bowl, sift together the flour, salt, and baking powder, and set aside. Place the egg, stevia, and vanilla in a large mixing bowl, and beat well with a wooden spoon or an electric hand-held mixer. Slowly add the butter, continuing to beat until the mixture is smooth and creamy. Add the flour mixture to the butter mixture, 1/2 cup at a time, stirring well with a wooden spoon after each addition. Fold in the chocolate chips. Drop heaping teaspoons of batter on the cookie sheet, about 2 inches apart. Bake for 20 to 25 minutes, or until the cookies are golden brown. * Instead of greasing a cookie sheet, you can cover it with parchment paper, which makes for quick and easy cleanup. From The Stevia Cookbook, copyright 1999 Ray Sahelian and Donna Gates. I’ve got some sweet drops liquid stevia from sweeleaf. An I’m not sure how much to use in some almond flour choc chip cookies. Thanks lovelies! For the diabetics out there, you may find Dr. Gregor’s nutrition facts. com site very helpful. I prefer Sunspire brand grain sweetened chocolate chips over Lilly’s stevia sweetened. They have more chocolate flavor and are also dairy free. They are sweetened with malted barley and corn so Celiac’s would need to avoid. I’m gluten intolerant and do OK with them. This cookie recipe is extremely high fat! Someone above commented on the packets of stevia. I buy Wal-Mart brand, and there are no sugars (dextrose) added. No cal. No carbs. I don’t know what brand you buy; you may want to try a different brand. Does anyone have the breakdown of carbs, sugars, calories, fat, etc.? You don’t need to use carob. There are dark chocolate chips sweetened with stevia by Lilly’s….expensive, but good! Yes, read comments. Quite dry, could use another egg and something like Apple sauce. Little more stevia too. Use regular salt. Sea salt is too salty. Use only 1/4 teaspoon of regular salt. Replace all or half of the butter with softened cream cheese. Also try 1/2 t baking powder and 1/4 t corn starch. Chill the dough (or dough balls) 2 hours before baking and bake cold. I wonder why so many do not read the comments before making these cookies, then you would know what to expect, and/or how to improve them. Adding bannana or applesause for more moisture, and an extra egg too. I am wondering if the confusion as to how much stevia to add might be the fact that some people are thinking Truvia = stevia. Truvia and stevia are not = in volume nor in ingredients. I also wonder if this accounts for some of the comments on how bland the taste is…they used 1/2 tsp of Truvia? I’m researching recipes to make chocolate chip cookies using Stevia and other non-gluten and low-acid ingredients. On my container of Organic Stevia, it states that Stevia is 2x sweeter than regular sugar. That being said, 1/2 tsp of Stevia would only equal 1 tsp of regular sugar. That would not be enough to sweeten a cookie in the recipe above given the amounts of the other ingredients. I think 1/2 CUP of Stevia would be more realistic. I’m new to making food to take into account dietary needs or restrictions, so I appreciate your expertise. Stevia in packet form is 2x sweeter than sugar because it includes stevia and a bulking agent like erythritol or dextrose. So a sweetener packet is only 1-2% stevia. 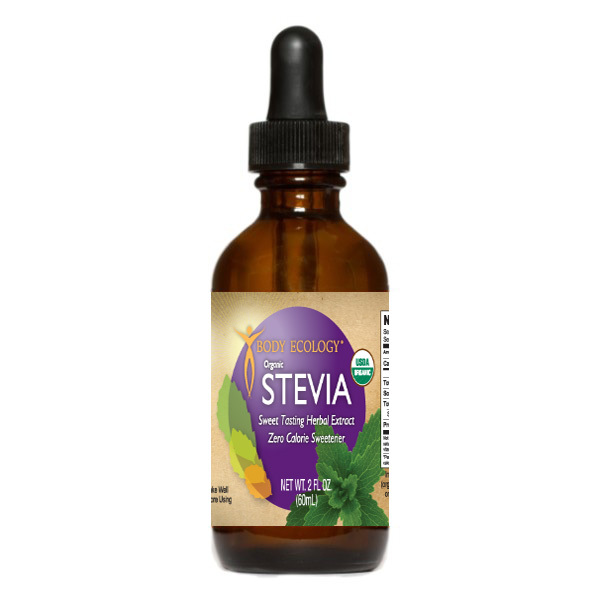 Pure stevia power, which you can find on amazon.com, is close to 300x more sweet than sugar. This is what I was looking for. A recipe using Stevia powder extract. [300x sweeter than sugar] Too many recipes call for the stevia that has the bulking agent of which I am allergic to some of the bulking agents ie… xylitol. Things have changed in three years maybe? No fillers/cal/carbs or dextrose in my packets. Still 2x as sweet as sugar. Read labels. too much salt and no liquid. how can you drop cookies when the dough is hard like pastry dough. To me these taste like biscuits with chocolate chips added. They were dry and crumbled easy, the chips fell off. The 2nd time I made them I reduced the flour to 1 1/2 cup and reduced the salt to 1/2 teaspoon, increased the egg to 2 eggs and increased the vanilla flavoring to about 1 1/4 teaspoon. I used my hands to knead the chips into the dough. I dropped them on the cookie sheet a bit bigger than the size of a quarter. Reduced the cooking time to 15-18 minutes. They still turned out to be a biscuit w/chocolate chips added but they were not as dry and didn’t crumble that easily and the chips still fell off. (serving size 1 cookie). The nutritional facts turned out to be: Per serving; Calories-73, Carbs.-5, Fat-6, Protein-1, Sodium-48, Sugar-0. The nutritional facts are from a free nutritional calculator on the web and may or may not be correct. You should put in your own ingredients and brand name, because that does make a difference. Update: Used the stevia w/maltodextrin blend for baking……much improvement in taste. Mixed 1 cup of the stevia blend with the flour instead of the egg mixture as it should be, all other changes stayed the same. Now a sweet biscuit w/chocolate chips. Nice bread dough recipe. If you’re going for cookie dough, add 1/2 cup of stevia with 1 cup of Greek yogurt. This recipe to the letter produced a very dry, bland, chalky tasting ball of half baked dough. If whole wheat flour is used do I use less flour or add more liquid in some form? When using Whole Wheat flour in baking: the ratio is 50/50 General purpose Flour to Whole Wheat Flour. I’m not sure your tollhouse recipe (of which this is a request for it, I would love to try to make those!) but sugar is 773 calories per 1 cup. So if the batter normally takes 2 cups, that is 1,546 calories! Stevia is pretty much considered a calorie-free sugar substitute although you may want to check your brand as some have trace amounts. However you go about it, you are saving a lot of calories. I have fibromyolgia and have problems with sugars and starches (flour included). Does anyone have a carab stevia recipe that does not have flour in it? The recipe I have is from the Gluten-Free Almond Flour Cookbook and thus I can not post it. However, the point is there are many non starch flour replacements out there. Almond flour being one of them. Find a recipe online and based on research as to the sweetness of Stevia, replace the other sweeteners or artificial sweeteners with the appropriate amount of Stevia and replace the chocolate chips with carab. Not the bottom of the recipe but the comments from others. I substituted coconut oil for the the butter and added shredded coconut (1/4 c) + 1 T Flax Seeds and 2 eggs and 1/2 C applesauce. The cookies tasted good and disappeared in short order. can you elaborate on your recipe: how/when to add the above? Sounds awesome and I need to impress my classmates with the deliciousness of stevia! I made the cookies and they taste great. I made half the recipe and got 10 small cookies. Shouldn’t I have gotten 24? You must have eaten some of the cookie dough.I do that all the time. I am a culinary student and do a lot of baking at my job. I have issues with sugar and decided to try baking with Stevia. I took the advice of others on here and added an extra egg. I also added about 1/4 of a cup of peanut butter for flavor. I used carob chips since they have less sugar and they melted nicely. As others said these do not spread so you will have to press them down with a fork like you would with a peanut butter cookie. Stevia doesn’t caramelize so these do not turn out brown like a normal chocolate chip cookie would. They came out more like a butter cookie but that isn’t such a bad thing. They are a little dry which is expected, so I might add a little mashed banana next time for moisture. Over all not a bad sugar free cookie. Bumped up the peanut butter to 1/2 cup and added a banana. mixed everything with my hands. They spread more and have more flavor. They also are darker in color because of the peanut butter. The banana gives them way more moisture, they actually taste like regular chocolate chip cookies. If you can’t have bananas I would try some apple sauce. Hi Megan, appreciate that you took the time to share your wisdom & expertise with us. Will be making these as you suggest. Yay, I have flour balls instead of cookies! They didn’t flatten, and have no cookie flavor. They actually just taste like flour! The chocolate chips didn’t even melt (most of them anyway). I used this recipe (with a few variations) to make probably the best cookies I’ve ever baked. I did add the extra egg as several have suggested, and used unsalted butter. I also substituted 1 1/4 cup of NuNatural MoreFiber Stevia Baking Blend for the stevia powder in the recipe. This gave the cookie more of the volume, texture, and taste of shortbread. We LOVED them! What if you add applesauce for some moisture? These were very nice made with 2 /12 cups of spelt flour – the spelt gave them a much more authentic cookie texture. Yes, you need to flatten them with a fork or they won’t spread. I used to do the Toll house as double batch same semi sweet chip. You can find dark chocolate chips, or use broken up dark chocolate chunks. It is 1/2 teaspoon. half a cup would be obnoxious sweet. I will be trying these so thanks for the tip on kneading them, I will be using whole wheat and unbleached flour so will see. I made these cookies for my 9 yr old granddaughter who is a Type 1 Diabetic. I added a second egg to the recipe, reduced the chocolate chips to 1/2 cup. I made each cookie with 3/4 oz of raw dough and flattened the dough with my fingers to make a larger, nicer looking finished cookie. Also instead of mixing the recipe with a spoon or mixer I used my hands, it seems the heat from your hands and working the dough made for a smoother batter. According to my granddaughter they are “real good”. Don’t the chocolate chips have SUGAR in them? Yes, the choc chips do have sugar in them. How about carob chips..? Liliy’s chocolate chips with Stevia don’t have sugar in them. Lily’s chocolate chips sweetened with stevia. to make items like cookies to help fill the void. And I am very greatful to have them! I am sure to have ‘regular cookies’ for friends and family, and keep stiva cookies around for me. Again, I am greatful. To me it is nice to have something for a change after going years and years without sugar. This did NOT work out…I did everything listed above, but the cookies never even cooked!. I left them in there for nearly 30 mins and they came out all flakey and chalky..
Ok… so I tasted them and they actually werent that bad 🙂 so dont be alarmed if they dont look like “normal cookies” they are a bit “chalky”, but the remind me of wedding cookies ( or butter cookies) with choc chips added.. I agree. I’ve made these before…yuck. My cookies did not melt like normal choc chip recipes do – they held their raw shape. They cooked but did not brown, are are very delicate… when you bite into it the cookie turns to powder! It’s like having a mouthful of flour! Very weird. Also, not overly sweet, even though I used 2 stevia packets, which is probalby about 3/4 tsp. 1/2 tsp is probably correct. Stevia is 200-300 times sweeter than ‘regular’ white sugar, so it only takes 1 tsp of the stevia powder to equal 1 cup of ‘regular’ sugar.